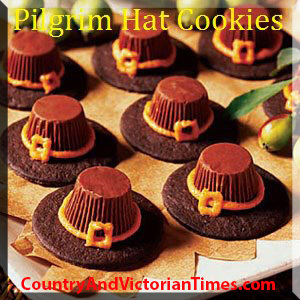 This entry was posted in Crafts ~ DIY ~ Projects, Recipes, ~Edible, ~Holiday, ~Party, ~Snack, ~Thanksgiving and tagged Baking and Confections, candies, candy, cookie, cooking, day, Holiday Cookies, Icing (food), Oreo, treats, ~Home, ~Thanksgiving. Bookmark the permalink. In the United States, the modern Thanksgiving holiday tradition is commonly, but not universally, traced to a poorly documented 1621 celebration at Plymouth in present-day Massachusetts . The 1621 Plymouth feast and thanksgiving was prompted by a good harvest. Pilgrims and Puritans who began emigrating from England in the 1620s and 1630s carried the tradition of Days of Fasting and Days of Thanksgiving with them to New England . Several days of Thanksgiving were held in early New England history that have been identified as the “First Thanksgiving”, including Pilgrim holidays in Plymouth in 1621 and 1623, and a Puritan holiday in Boston in 1631.